"Planet Wisp" redirects here. For the DS version of the stage, see Planet Wisp (DS). 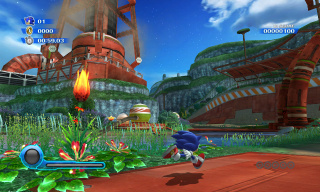 For the Sonic Generations version, see Planet Wisp (Sonic Generations). Planet Wisp is the fourth stage of Sonic Colours. This planet is actually the home world of the Wisps. It is an industrial level built into a mountainside, leaving plenty of room for jumps through twisting metallic structures. Eggman captured the Wisps in order to fuel his interstellar theme park. Back at Eggman's laboratory, Orbot tries to install the correct voice chip for Cubot, but ends up giving him an annoying pirate voice instead. After giving Orbot a piece of his mind, Eggman plans to use his mind control beam on Sonic's home planet to add it to his collection, thereby completing his amusement park. Meanwhile, Sonic and Tails arrive on Planet Wisp and notice something very "Eggmanish" about it, as it is currently under construction to become part of his theme park. The Wisps are terrified about the state of their planet and notify Sonic and Tails of the tractor beam generator. Sonic begins in a field of grass which in the breeze, and as he runs forward through the various rock outcroppings, very quickly the scenery becomes an agglomeration of Eggman's characteristic architecture and the originally pure Planet Wisp landscape. Sonic must drift around corners, grind rails suspended above poisonous waters. A 3D-to-2D transition sends Sonic into one of the first of many of Eggman's main structures, where he can either blast through glass ceilings with the Rocket Wisp, or utilize the new power found in the level, the Spike Wisp. With the Spike Wisp, Sonic transforms into an invincible spike ball that can stick to any surface, thereby allowing him to find Red Star Rings, and discover new paths. In addition to this power, Sonic can use a charge move reminiscent of the spin dash to quickly speed through. With the Spike Wisp, much like with other Wisps found in the game, Sonic can destroy black crates. A quick step section is also included within the level. After jumping across platforms and using the Spike Wisp, Sonic reaches the goal. Planet Wisp Act 3 starts out with a catwalk Quick Step section where Sonic must collect White Wisps, which will fill some of the boost gauge so that he can destroy the Egg Pawns in his path while simultaneously dodging lasers from the Aero-Chasers to stay on the high path in order to reach the first Red Ring. Following this is a short drift section that will lead Sonic directly into a 2D block section. Using the Blue Cube Color Power, the player must transform the blue blocks and destroy the Wisp blocks to make it to the lower portion of the stage. Using the small solid and platform blocks as platforms, the player must traverse over a large pit to reach the blue blocks or crane lift that lead to the goal ring. If you didn't realize it, from Act 1 and Act 3, Act 4 begins in an area, after the ending, where you reached the previous goal rings. Sonic runs through a tunnel, and you evenutatly go through a drifting zone. After crossing a "bridge of doom," you get to a tower that seems large in size. You, basically scale up this large tower, then you're at the goal. As he grinds through a piece of Eggman's facility, Sonic heads out to the generator far away from his reach. After defeating two enemies and reaching the next grind rail (or heading down below to the Red Ring), he grinds his way to another architectural area, avoiding the poisonous water down below. If possible, the player can use the Green Wisp to hover around and collect the rings and don't travel through the little elevator lift. After using the Pink Wisp to reach the higher room, a ramp followed by another set of grind rails leads Sonic to a 2D section made entirely of small platform blocks with a vertical, shelf-like layout. As the player travels upward, a switch reveals a line of rings that can be reached by using the Green Wisp. Using the Pink Spike Color Power, Sonic travels upward to find the fifth red ring and drops down to the goal ring. This page was last edited on 17 March 2018, at 08:37.